This article explains some of the common issues you may encounter while running the Fathom Desktop Connector, with accompanying resolutions. We have a series of troubleshooting steps which may help to easily resolve the situation before you need to contact Fathom support. The first thing you should do is make sure you have the most recent version of the Desktop Connector installed. Usually the Desktop Connector will update itself automatically, but we have encountered corrupted installations in the past. This will remove the current copy of the Desktop Connector. After doing this, please login to Fathom and attempt to download and run the Desktop Connector again. Once we are confident you are up to date, we can verify that the Desktop Connector starts properly. 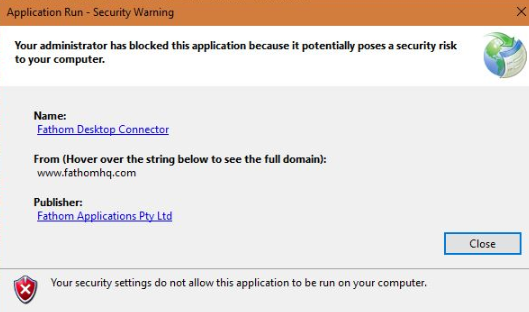 You may see an dialog similar to this, with the message, "Your administrator has blocked this application because ..."
A Digicert certificate is used to sign the desktop connector. You should first check that you have the correct root certificate installed. Go to this webpage and verify that no warning is presented. If the root certificate turns out to be the issue then, if you are comfortable, you can use the following utility to repair the certificate chain. For advanced technical users, you can edit the Windows Registry to verify that the correct trust is assigned to Click Once applications (eg. The Fathom Desktop connector). This article helps demonstrate the changes required. For more information please see the following article from Microsoft. Add Fathom as a trusted site in your local internet settings. Open Windows Control Panel and go to Internet options (you can also access these settings by opening the Start menu, typing Internet options and pressing Enter). 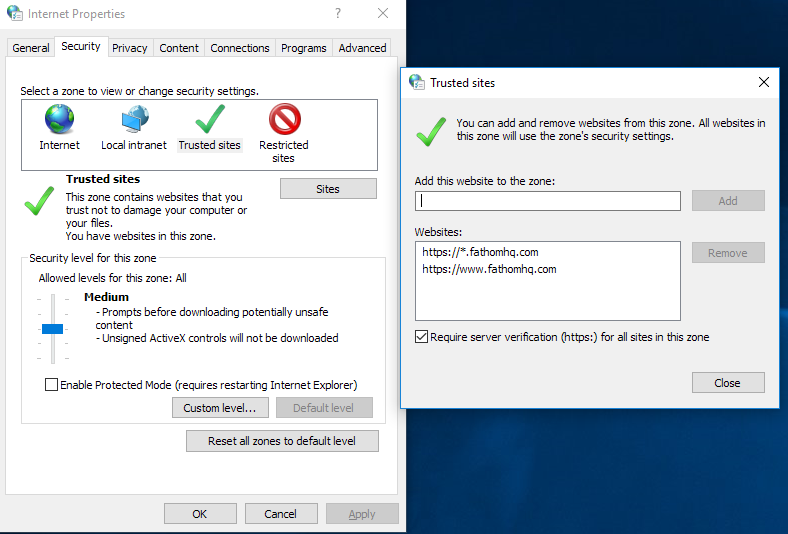 Click the Security tab and select the Trusted Sites zone. In this case we need to find the error detail from the 'Event Viewer' in Windows. You can start the event viewer by going to 'Start' in Windows and typing 'Event'. Once it has started, go to 'Windows Logs > Application' to see if you can spot any error related to the Desktop Connector. Please copy and paste the detail from this error and send it to us. Instructions related to the Windows Event Viewer can be found at this website. This error is caused by not having the correct .NET Framework version installed. Due to a recent Microsoft update we now require that the computer running the Connector has the Microsoft .NET Framework v4.7.1 installed. Please see the instructions for installation in the requirements section. 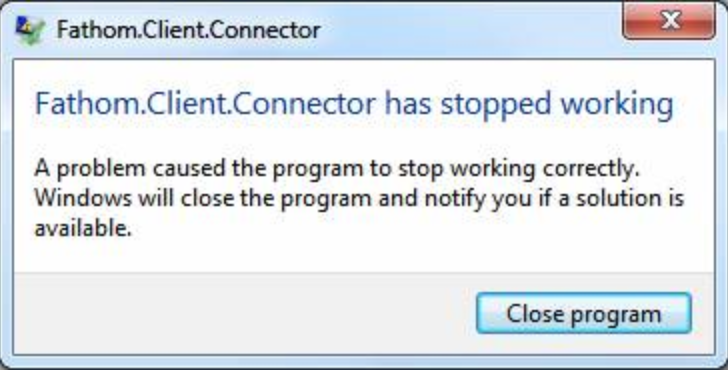 If the Desktop Connector starts properly and the problem occurs subsequent to this, it often helps diagnosis if you can send us the 'Support Log'.